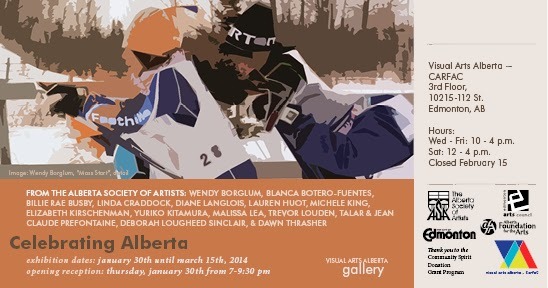 View Celebrating Alberta from January 30 - March 15, 2014 in the Visual Arts Alberta Gallery. Join us for the opening reception on Thursday, January 30 from 7-9:30pm. The gallery is open from Wed-Fri, 10-4 pm and Sat, 12-4pm. Please note the gallery will be closed on Saturday, February 15.